SO YOU WANT TO LEARN TO DIVE IN SOUTH LOMBOK? Learning to dive in South Lombok is a great experience for your diving skills. The secret Southwest Gilis have white-sand beaches and are yet to be discovered by most travellers so are still remote. 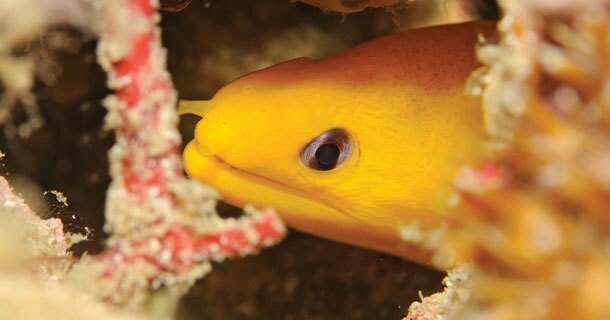 We have over 25 colourful Dive sites full with many critters. Sloping sandy bottoms ideal for learning skills during your Open Water Course. The most popular scuba diving course in the world is the PADI Open Water Course, and we can run this for you in South Lombok over 3 or 4 days. We are based in South Lombok, a tropical-island location that offers a relaxing and friendly environment, with world-class diving at your door-step. With prices from US$315, it will not break the bank! Course over 3 days; extra 2 days of fun diving with 4 fun dives (including the 40% discount above!) and 6 nights budget accommodation. 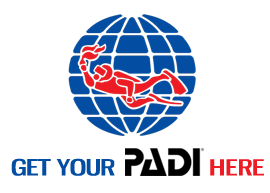 OW Course over 4 days as above PLUS 4 fun dives (including the 40% discount above!) after certification with full dive equipment rental. Accommodation extra. 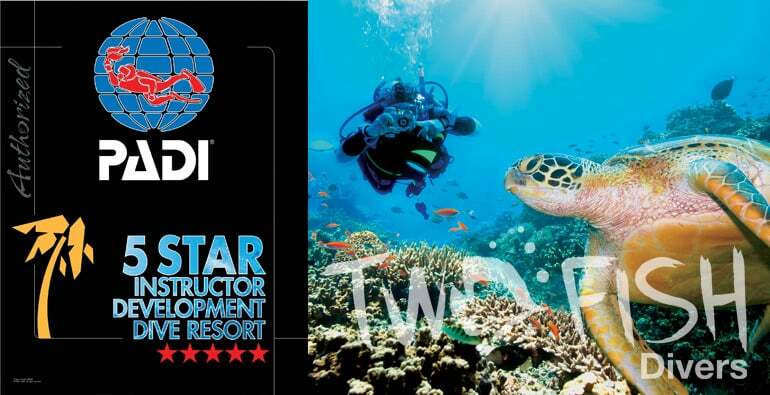 Includes 3 pool training sessions, 2 open water training dives, dive equipment, certification & OW manual. Access is extra. Our Try-dive that includes equipment, pool session and 1 open water dive. Additional dives with an instructor are also available. 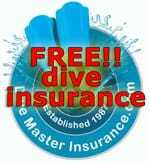 Includes open water dives, dive equipment & certification. We are very pleased to announce that we have entered into a partnership with DiveZone, a dive operation that has been in South Lombok for more than 10 years, which means that Two Fish guests can also add diving Lombok to their Indonesian dive trips. Most of the dive sites are pristine coral reefs with colourful soft corals and crinoids, vast staghorn coral fields and huge table corals in the shallow parts, giant elephant ears in the deeper parts, giant sponge barrels along the slopes. 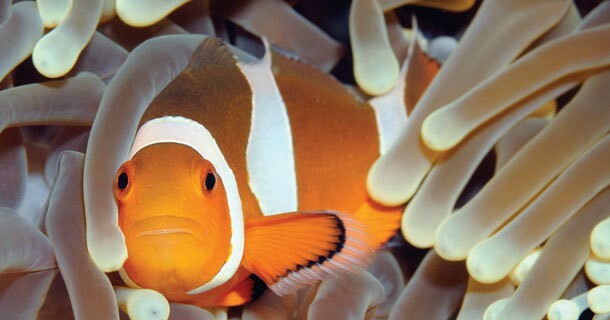 These reefs harbour bright colourful tropical reef fish such as angel and emperor fish, damsel and butterfly fish and many more. 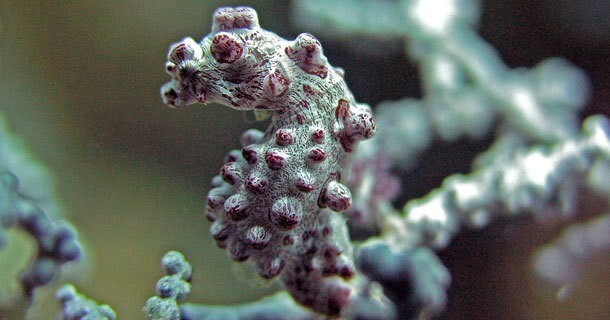 The corals hide a variety of shrimps, crabs and of course nudi branchs. 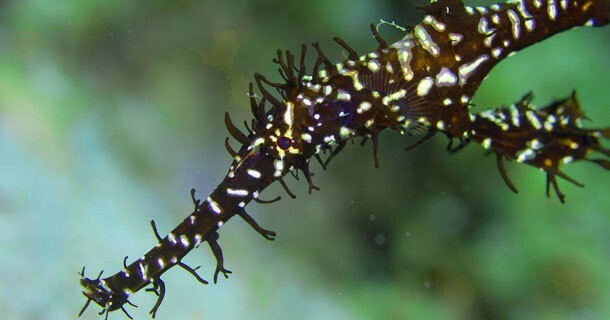 Our guide will help you hunt down also the pigmy seahorse, ghost pipe fish and frogfish. Also the green sea turtle, a variety of moray eels, blue spotted stingray, cuttlefish, squid, octopus, lion and scorpionfish, flathead crocodile fish are part of the scenery. Occasionally you will encounter a white tip shark. 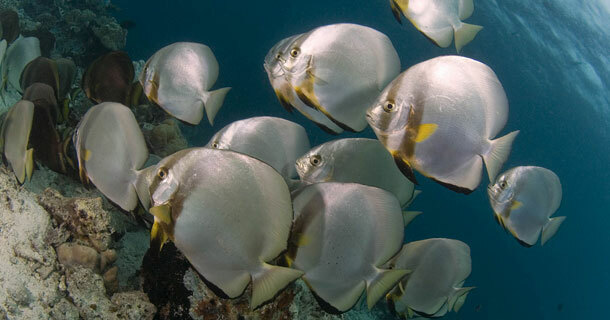 The sea is fairly shallow, visibility never crystal clear but this doesn’t affect the caliber of the dive sites.We offer diving all year around with sea temperatures of 26-30C and visibility 10-20 meters. Only the months January and February might have a low visibility and doesn’t go higher than 10 meter due to the heavy rains. WHAT WILL MY EXPERIENCE BE LIKE ON SOUTH LOMBOK? 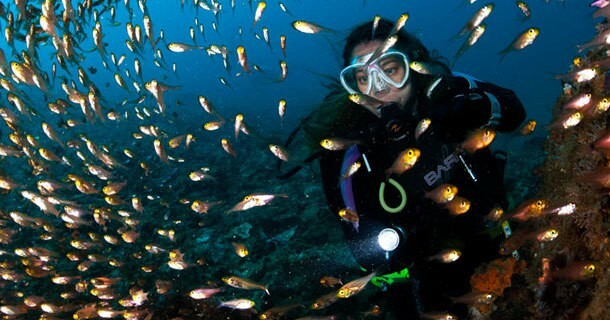 Popular Dive sites for the Open Water course are Batu Layar, Gili Ringgit west, Coral beach and our famous The Jetty where we have the chance to be surrounded by schools of Sardines to end the dive. We have a cosy chill out area with big beanbags where you will watch the PADI Open Water Videos and go over the theory part of the course with your Instructor. For the confined sessions we make the 10-minute boat-ride to Gili Layar, the second of the 3 South Gili Islands, where there is a nice gentle sandy slope that ranges 2-5 meters and offers a perfect location to learn and practice your confined water skills. We take as much time as needed to build confidence and good Buoyancy skills, and once ready for action we then have our 4 Open Water dives scattered around the 3 South Gili Islands. The schedule for your course is flexible depending on your needs but in general it starts with theory and skill sessions on the first two days, followed by the 4 open water dives over the last two days of the course, with 2 dives on each day. Normally you will have some free time in the afternoons on the 3rd and 4th day, this can be used to explore the island or catch up on any theory, exams or extra skills that are needed. With your theory already completed before you get here, the first day will be spent in the pool, two open water dives the second day, and then two more open water dives on the last/third day. WHY SOUTH LOMBOK FOR YOUR OPEN WATER COURSE? South Lombok is the perfect place to start your underwater adventures. The area is fantastically remote with white-sand beaches, and the quiet South Gili Islands are full of hard and soft corals, and clear waters with calm surfaces and small currents that can easily can be avoided. The reefs are home to many small Critters such as Ornate Ghost Pipe fish, Nudibranch, Leaf Scorpion fish, Frogfish, Garden eels, a wide range of shrimps, Porcelain and orangutan Crabs and our cute Pygmy Seahorses. 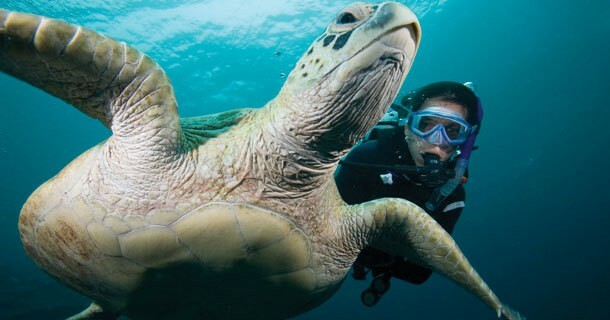 There is also the bigger underwater life such as Moray Eels, Stingrays, Bluefin Trevally, Turtles, Barracuda and much more. A perfect place to practice your new found skills! For more information please check out our Getting to and from Lombok travel section page. Our dive centre is located at the Villa Pao Pao – a unique luxurious 3-bedroom villa situated on the idyllic island of Lombok and is set just 40 yards from it’s own beach. Read more here. We also work with the lovely tropical island resort Pearl Beach on Gili Asahan. It is a beach side resort with 4 brick beach bungalows only 20m walk to the white sandy beach, with a spacious wooden deck terrace with swing bed for the relaxing moments. If you wish you can watch the sunrise from you bed. The Bamboo Cottage are set in the garden with terrace and hammocks and of course ocean views. All the rooms are comfortable and clean. The accommodation is half board with breakfast and dinner included as well is free flow of drinking water. Swimming, snorkeling and of course Scuba diving is popular at their home reef and kayaking to explore the open sea and other islands. Bola Bola Paradis is another option on the mainland of Sekotong. They offer 11 beach side rooms in total : 4 Standard rooms,3 Superior and 4 De Luxe. The Standard and De Luxe are situated in the tropical garden and the Superior in the main building annex to the reception and the restaurant. The rooms are comfortable and clean and provide fans and cold water showers. The accommodation includes breakfast. Find out more about all accommodation options around South Gilis. Get 10% off your Advanced Open Water Course. You can do this at any of our dive centres across indonesia within 2 weeks of completing your Open Water Course. 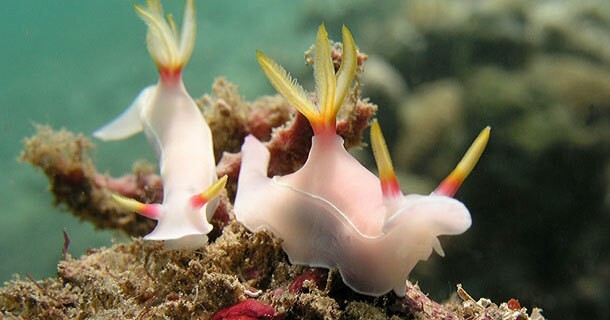 WE LOOK FORWARD TO YOU LEARNING IN LEMBEH WITH US AND IN THE NEAR FUTURE! !